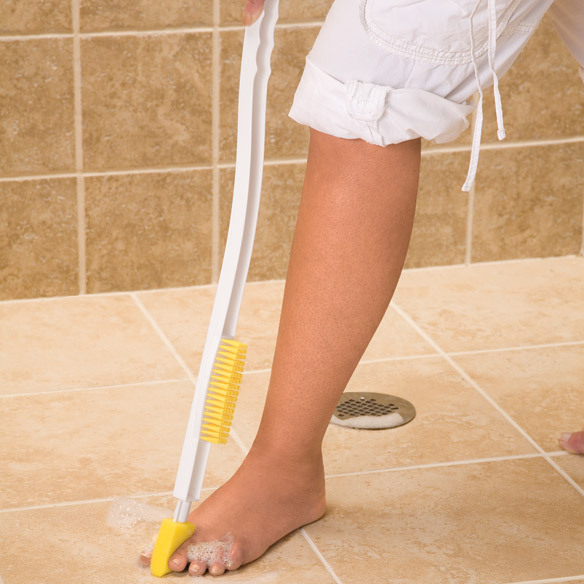 Long handled foot brush enables you to cleanse your feet without stooping or bending. 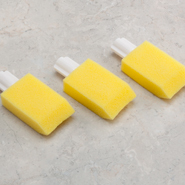 Foot cleaning brush has two, interchangeable sponge heads, one for cleaning, one for applying lotions or medicines. Nylon bristles on handle can give you a stimulating massage. Measures 25" long. I was not expecting much when I ordered this. I had bought other products only to be disappointed. This was a hit! It is easy to use, and soft enough not to damage skin between toes. You must use it gently, but it works just fine. Works great. Good price. I should have bought one a long time ago. Unable to bend so this product helps. I work as a nurses assistant and needed a product to help a patient who cant bend fully scrub their feet. Upon searching online I came across this product. What a great find! I was sceptical about the strength of the brush but after a few months it a still holding up strong. The inventer is incredible they were really thinking smart. It makes it so easy for me to clean between my toes. This foot brush helps my wife wash her feet and toes very easyly and it feels good to her. She is disabled and it was very diffucult for her to do this task safely in the shower chair and shower. Ian a diabetic and it's hard for me to reach my feet. This item is great one of the best things I ever bought. It gets in between your toes cleans and dries .thank you for this product it saved my feet. The food brush is just what I needed to keep my legs and feet lotioned. Not bing able to reach my back, legs or feet due to being handicapped, I find this long handled brush is perfect. The great thing is that you have various brush pads the use on specific areas on the body. I love it. I have rheumatoid arthritis and can use any help I can get and this is a great help. I have been looking for a product such as this. It makes my feet feel and look so much better. Thank you Walter Drake! Finally a product that is perfect for my handicapped husband to clean between his toes without my assistance. He is thrilled being able to have this item to do the job on his own. Great product for the elderly. I have limited access to reach my feet, and this product has definitely solved my problem. Use in the shower to clean my feet and especially between my toes. it gets me to where i cannot reach anymore myself. a huge help when showering. It is perfect for applying lotion or creme to legs and top of feet. Not so good for washing between toes as the sponge falls apart in no time....I had to improvise with another material which works quite well. The pretty little yellow sponge is not very sturdy!!! I looked all over for a bath aid to clean between my toes after an injury made it difficult to bend over while bathing. Found this and its works nicely. Gave it 4 instead of 5 stars only because the sponge attachment tends to loosen after use- just tighten it before using. Be sure to order extra sponge pad refills. I'm ordering another just to be sure I always have one. Really like this item. I was always having a hard time washing between my toes until I found this product. Thank goodness someone thought of this. I could not bend down and my toes are crammed together so there aren't too many things I could have used, luckily this slips easily in between the toes. This product adds more intensive cleaning for the area between the toes. This order was useless! Please refund the account. This product did not work and fell apart after a couple of uses. Husband can not bend down to clean between his toes when showering. This is the closest product we could find which will serve his needs. Very convenient to use and its not found in stores. Back surgery I have trouble standing on 1 foot while cleaning the other foot. This item was indispensable to me when I had my first hip replacement as you're not permitted to bend for 6 weeks. I can't bend down because of chronic back pain. Need to clean between toes. Chosen because I can't reach my toes without pain. I need to be able to clean my feet. I have trouble reaching them. My husband can’t reach his feet. I need to clean between my toes and I have difficulty reaching my feet because of recent surgery. Because I need I'm old. HELP ME MAKE SURE I CLEAN BETWEEN TOES BETTER. Difficult for me to bend. Hope this helps. Limited bending, seems good to use for washing my toes. Need help in the shower. I already own one of these and I love it so much so that I am buying one for my Mom. when you run out of refills, could I more from you to be sent to me? BEST ANSWER: Thank you for your question. Yes, we do offer refills for this item. We have included a link below. We hope this information will be of help to you.